ROSEMONT, Ill. – The Big Ten announced the 2018 postseason volleyball awards on Wednesday, with standouts from Illinois, Minnesota and Penn State earning recognition. 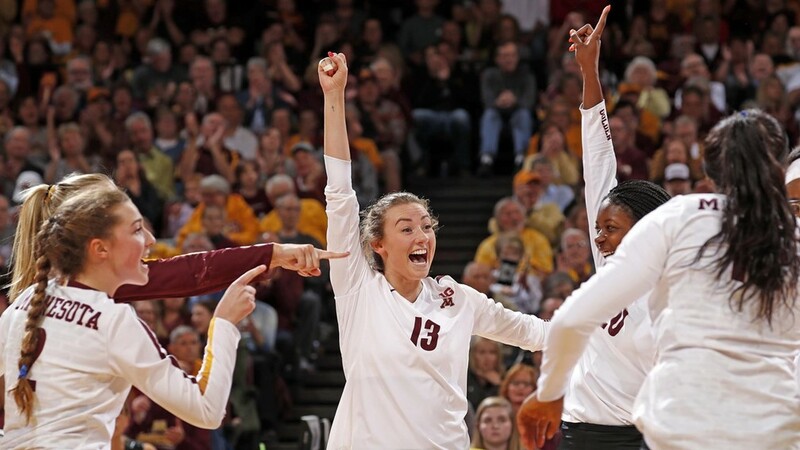 The Gophers’ Samantha Seliger-Swenson was named the Big Ten Player of the Year by a vote of the conference’s coaches. Penn State’s Kendall White was tabbed the Big Ten Defensive Player of the Year while Illinois’ Jordyn Poulter and Minnesota’s Seliger-Swenson earned Co-Setter of the Year honors. Penn State’s Jonni Parker earned Big Ten Freshman of the Year honors, while Minnesota head coach Hugh McCutcheon was named Big Ten Coach of the Year by the conference’s coaches and media contingent. Seliger-Swenson, a unanimous All-Big Ten selection, ranked second in the Big Ten in assists per set with 11.76, which ranks seventh in the nation this season. The Minnetonka, Minn., native was named a Senior CLASS Award finalist and earned Big Ten Player of the Week recognition seven times this season. The senior lead Minnesota to its third Big Ten title finishing the conference season with a 19-1 record. Seliger-Swenson is the sixth student in Minnesota history to be named Big Ten Player of the Year and the third in four years. Minnesota’s Sarah Wilhite earned the honor in 2016. White earned unanimous All-Big Ten honors and ranks third in the Big Ten in digs per set with 4.79. The Zionsville, Ind., native earned Big Ten Defensive Player of the Week recognition twice this season. She is the fourth Penn State student to earn Defensive Player of the Year accolades and the second in as many years. The Nittany Lions’ Haleigh Washington claimed the award last season. Poulter, a unanimous All-Big Ten selection, averaged 11.77 assists per set during Big Ten play, while leading the Illini to a .265 team hitting percentage. The two-time Academic All-Big Ten honoree was named Big Ten Setter of the Week five times this season. This is the first Setter of the Year award for an Illinois student since the award’s inception in 2012. Parker averaged 2.99 kills per set and a .258 hitting percentage in her first collegiate campaign. The Casstown, Ohio, native earned Big Ten Freshman of the Week honors three times this season. She is the 13th student in program history to win the award and the first since Haleigh Washington in 2014. McCutcheon earned top billing among the conference’s coaches and media contingent for the second time, the first honor coming in 2015. This season he guided Minnesota to a 25-3 overall record, a 19-1 mark in Big Ten play and the Gophers’ third Big Ten Championship. Under McCutcheon’s leadership, the Gophers earned the No. 2 overall seed in the NCAA Tournament. The award marks Minnesota’s fourth Coach of the Year honor. Eighteen Big Ten players were named All-Big Ten by the conference’s coaches, with 10 unanimous selections. Joining Parker, Poulter, Seliger-Swenson and White as unanimous honorees were Illinois’ Ali Bastianelli and Jacqueline Quade, Michigan’s Carly Skjodt, Minnesota’s Stephanie Samedy, Nebraska’s Mikaela Foecke, Purdue’s Sherridan Atkinson and Wisconsin’s Dana Rettke. Joining Parker on the All-Freshman team were Michigan’s Paige Jones, Minnesota’s CC McGraw and Adanna Rollins, Nebraska’s Nicklin Hames and Callie Schwarzenbach, and Penn State’s Kaitlyn Hord. The complete list of All-Big Ten honorees, individual award winners and Sportsmanship Award Honorees can be found below. JMHO, but not having Lexi Sun anywhere on this is embarrassing. She is a six rotation player who played timely and came up huge in the last half of the conference schedule. Sort of sad, actually.